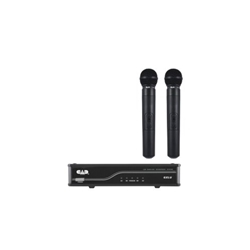 • Two discrete channels of wireless packaged in one receiver chassis. • Compact discrete antenna that recess when not in use. of connectivity and audio source. equipped with 1/4 inch input connections. • Battery life of >10hrs. • Handheld transmitter features battery life indicator. condenser headworn mic included in the system.